Our guest book reviewer today is Emily Ruth. Born 6th of a family of eight, Emily Ruth has been all the way through homeschooling; from birth to graduation. In 2012, she graduated from Grand Canyon University and received her teaching credentials. At this time, she is now acting as a guest teacher in her hometown public school system. From the time she learned to read, Emily has been gorging herself with literature. Some of her very favorite books growing up were “A Little Princess”, “The Crimson Fairy Book”, “The Green Fairy Book”, “The Scarlet Pimpernel”, and all the Austen books she could get her hands on. Enjoy her delightful review of The Princess and the Goblin. If a little girl told me she had visited her great-great grandmother in the attic, I wouldn’t have believed her either. Such is the life of the little Princess Irene who lives in a huge mansion on a mountain with her nurse and other such occupants to attend her. For all the eight years of her life, Irene has lived unaware and blissfully ignorant of the existence of the Goblins, a fae race that lives under the mountains. They had lived on the surface, but were banished underground, and due to this, kept a burning hatred for not only humans, but especially the royal line. One rainy afternoon, as Irene is exploring the corridors of the mansion, she gets lost, and discovers a hidden occupant of the attics who introduces herself as Queen Irene, Irene’s great-great grandmother. Soon afterwards, Princess Irene and her nurse, who were out for a walk, are saved from a group of Goblins by a brave peasant boy, Curdie. Irene, now aware of the danger around her, soon starts to show her true noble colors. She is aided by Curdie, who discovers a plot against the kingdom and against the princess’s freedom by the goblins. This tale is great fun, and there is much entertainment in reading it. The plot is somewhat convoluted, and not as simple as children’s books usually are, even for that day’s standards. The character development, however, is incredibly charming to read. Irene goes from a frightened little girl to a brave princess, and Curdie, who is already quite brave, must learn that things are not always what they seem, and to trust the trustworthy. This book was written a very long time ago, before children’s books started to include “fantasy” as a genre. At this time, the only fantasies you could get was either in adult novels or stories, such as the fairy tale books that Andrew Lang compiled (another review for another time), or the Arthurian Legends. When George MacDonald came out with his “the Princess and the Goblin”, he was providing the world with the natural next step in children’s literature; and single-handedly reshaped modern children’s literature. C.S. Lewis and J.R.R. Tolkien read George MacDonald’s books, and the Chronicles of Narnia and the Hobbit were both influenced by his writings. 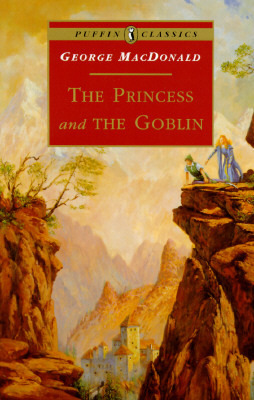 Thus, however indirectly, many of the fantasy books you read today are influenced by “the Princess and the Goblin”. Is there a book or an author that you look up to the most for having inspired you towards something you love? @Leah Haha! Emily is a sweet friend of mine 🙂 How did you connect with her? @Emily – Beautiful review! This book is special.